The Secret’s Out! Letter Formation Rules! Letter formation usually includes the ability to correctly form both letters and numbers. Research has shown that good letter formation is a significant predictor of the mastery of good handwriting. Looking at what is letter formation with this easy infographic from The Happy Handwriter will take you through the steps toward mastering letter and number formation. Following this sequence to well-developed letter formation will assist in contributing to well-developed handwriting. As we know, good handwriting contributes to composition and story writing skills. Children who were exposed to a programme focusing on the improvement of letter formation compared to those who weren’t, displayed an improvement in story writing and composition. This reminds us how important letter formation really is as an underlying foundation for scholastic progress through the foundation phase and beyond. Letters and numbers are made up of basic lines, strokes and shapes. The basic strokes including the vertical, horizontal, circular and diagonal lines need to be mastered first. Children are going to run into trouble if they are trying to write letter and numbers without first having mastered the strokes. There are many worksheets on the internet that focus on tracing over the basic lines and strokes. When choosing, please do be sure to analyse if the required level of refined pencil control is age appropriate, as well as ensuring there is opportunity for sufficient repetition for your child to master the strokes. So often there seems to be a developmental mis-match between the required level of dexterity, and the skill you are trying to develop. 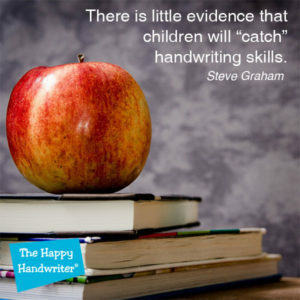 We don’t want to be asking our children to trace over small lines when their motor skills just aren’t yet there. Follow the link for a unique fun and engaging approach based on developmentally appropriate large movements, supported by songs, to facilitating the development of the basic Lines and Strokes in the pre-school child. The next developmental step for our children is to be able to put the Lines and Strokes together to form the basic shapes. Our multi-sensory Shape Builder takes your children on a kinaesthetic, auditory, tactile and functional journey to the mastery of shapes. With the delightful Aliens to guide your children, they will be begging for the Shape Builder every day! The correct starting positions are critical. Consistently forming a letter or number from the same (correct) starting position, is going to support the development of a fluid script which will support the handwriting speed required as your child progresses through school. In addition, incorrect starting positions can lead to letter and number reversals. If a child starts the letter “d” from the top with the stick of the letter, there is the possibility to turn to either the left or right when forming the tummy of the letter. And if they travel to the right when forming the tummy, the child is going to end up writing a “b” and not a “d.” Compare this to starting the letter “d” with the “c” shape where your child is going to have to get very creative to be able to turn that letter into a “b” without lifting their pencil. 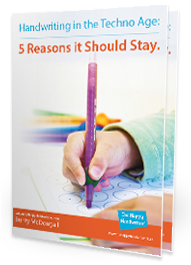 If we can get starting positions right from the beginning, we can significantly reduce the number of children who struggle with letter formation and handwriting. Automatic letter formation is achieved through repetition. We can reduce the number of repetitions required to lay down the motor map of a letter by making use of a multi-sensory approach to handwriting. Enhanced sensory input, whether touch, auditory or other input, is going give the brain more information about how the letter or number is formed. And the more information the brain has, the faster the letter formation motor map is going to be established and consolidated. The creation of Rainbow Letters and Numbers® – each letter is traced with every colour forming a rainbow letter – is going to provide the opportunity for multiple repetition which is a must when it comes to establishing automatic handwriting. All our handwriting books use the Rainbow Letters and Numbers to ensure the sound establishment of letters and numbers. If you are working in a one-on-one situation where you can monitor the formation patterns used by your child, the OT toolbox has some lovely ideas. Please just be sure while doing these that your child uses the correct starting positions and formation patterns. We aim to “master the motor map®” in the brain so handwriting is automatic. The “motor map” is the set of instructions in the brain for letter formation. If your child is consistently using incorrect formations or reversing their letters, they are practising them in the incorrect formation patterns. And when this happens, the motor maps, or sets of instructions in the brain on how to form them, become hardwired in the incorrect pattern. And incorrect patterns that are hardwired are very difficult to remediate later on. Remediation is assisted through the use of a sensory-motor approach using fun letter formation activities. Our goal is to establish these in the correct formation patterns from the start which is in keeping with our motto of “the right way the first time!®” No more guessing what is letter formation – you are now good to go following the steps in our Infographic. Tags: fun letter formation activities, handwriting, letter formation, occupational therapy learning activities., what is letter formation?